In late 1944, three Japanese military supply ships near the tiny South Pacific island of Anatahan came under American air attack. The ships were sunk and their crews left stranded on an island. The survivors ignorant that the war was long over were forgotten until 1950, when the Americans began making serious rescue attempts. In the 1950s, the story of the Anatahan holdouts became the basis for multiple films, books, and lurid yellow journalism. Why? Because the Anatahan story contains an intriguing twist in the form of a lone woman—Kazuko Higa—among the dozens of military survivors. Inspiring rivalries, fights, and even murder, it was her presence that made the holdouts reluctant to go home. 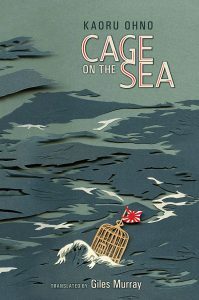 Cage on the Sea is a novel based on painstaking research by author Kaoru Ohno, a journalist and nonfiction author. It goes well beyond stereotypes to explore the psychology of both victors and the vanquished.